If you send links in SMS messages, you may have encountered the challenge of trying to fit the URL and the rest of your message in 160 characters. 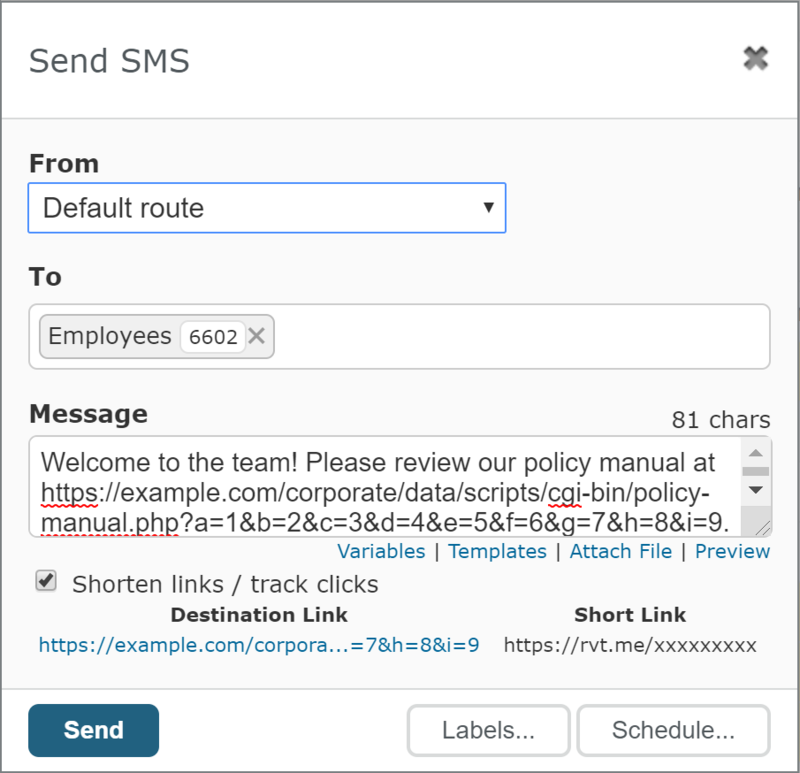 Now, we’re happy to announce Telerivet’s Short Links feature, which makes it easy to shorten URLs and track clicks in your SMS messages. Telerivet will show you every contact who clicked the link (or didn’t click it), as well as overall statistics to help you optimize your messaging campaigns. Telerivet adds “https://” for security, but you can remove it on the Messaging Settings page to shorten the link to 16 characters. When any contact clicks the link, they will automatically be redirected to the destination URL, and the contact will show up as “Clicked” on your Messages page. Although the Messages page shows the short URL like https://rvt.me/xxxxxxxxx﻿, each contact actually receives a unique URL (not all x’s). This is different from link shortening services like bit.ly — if you send short links from a link shortening service, everyone would receive the same short URL, and you wouldn’t know who actually clicked the link. The actual unique short URL is hidden from the Messages page, because if you opened it in your browser, Telerivet would count it as if the contact clicked the link. The Messages page also shows the destination link, which is not sent as part of the SMS, which you can click without being tracked. Accounts on Enterprise plans can replace rvt.me with their own domain name or subdomain. To use a custom short link domain, contact support@telerivet.com for more information. The Short Links feature supports link previews on iOS and Android. If link previews are enabled on the recipient’s phone, the SMS app may show a title, domain, and an image from the destination page, giving the contact more confidence about the short link. 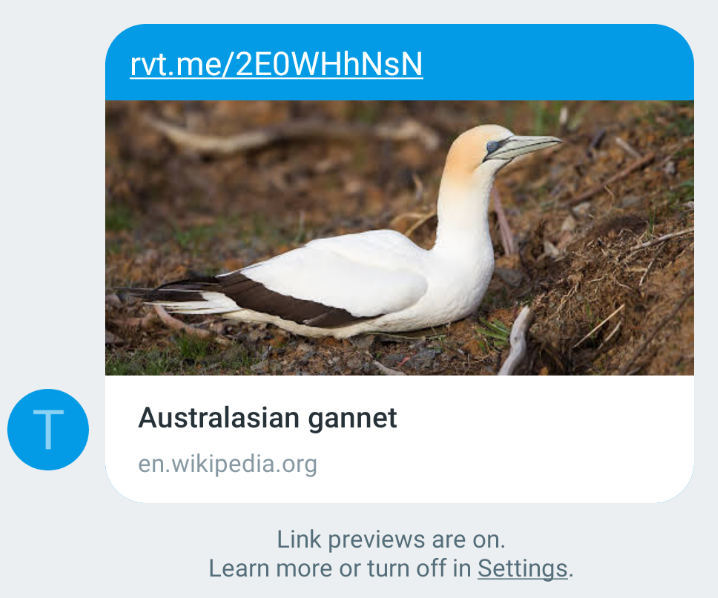 When a link preview is loaded, Telerivet marks the message as delivered, but does not count the message as clicked until the contact actually opens the link. If you send a short link to multiple contacts, the Broadcast Details page shows the real-time click-through rate and total number of contacts who clicked the link, and a chart with the number of contacts who have clicked the link in 15 minute intervals. When viewing a broadcast, the Short Link filters show who clicked the link, and who didn’t click it. Details about which links were clicked are also included when exporting messages to CSV. For organizations sending SMS messages from their own systems, the Short Links feature works seamlessly with Telerivet’s developer API. When sending messages via the REST API, just set the track_clicks parameter to true, and Telerivet will shorten URLs and track clicks within the message content. If you configure a webhook URL for status notifications, Telerivet will also notify your webhook URL when the contact clicks your link, with clicked_time set to the timestamp of the click. The Short Links feature is available to users on the Pro plan and higher Custom plans. To try it out, compose a new message and paste a URL starting with http:// or https:// into the Message box. If your current plan doesn’t include this feature, you can upgrade to Pro to start shortening links and tracking clicks. To send branded short links, Telerivet’s Enterprise plans support replacing rvt.me with your own short link domain. To use a custom short link domain, contact support@telerivet.com for more information. We are very excited to announce that Telerivet is now available as an app for iPhones and iPads, as well as Android phones and tablets. You can use the app to send and schedule broadcasts, view and edit contacts, manage automated services, and more. Almost anything you can do from your web browser, you can do on the go. In addition, the iOS and Android apps let you get (optional) notifications of incoming messages. If someone sends a text message to your virtual number, you can read the message and reply directly from your phone. Since Telerivet runs in the cloud, you can switch back and forth between the smartphone app and the web dashboard at any time. When using the app, text messages and voice calls are sent and received via third-party providers such as Nexmo, not via your personal phone. When you send SMS messages or calls from the app, your contacts will see your organization’s sender or caller ID (as configured in your Telerivet account), not your personal phone number. The iPhone and iPad app supports iOS 10.0 and above. The Android app works on Android 4.4 or above. As you may know, Telerivet already had an Android app that turns an Android phone into a SMS gateway in any country. The new Android app, however, does not turn your phone into an SMS gateway. Telerivet’s original SMS gateway app is still available, and it will continue to be supported and developed. There are just two separate Telerivet Android apps now because they serve different purposes. To avoid confusion between the two Telerivet Android apps, the original Telerivet Android app has been renamed to “Telerivet Gateway“. The Telerivet Gateway app lets you use Telerivet to send and receive SMS messages in any country via that Android phone’s SIM card. Typically, users will dedicate a phone specifically for the Telerivet Gateway app, and won’t use it as a normal mobile phone. We’re excited to hear your feedback on the new Android and iOS apps — let us know what you think at support@telerivet.com. In the past 5 years, thousands of organizations across more than 150 countries have relied on Telerivet to send and receive text messages. Today, we’re excited to announce the launch of Telerivet Voice, which organizations can use to automate voice calls with their customers, employees, and community. 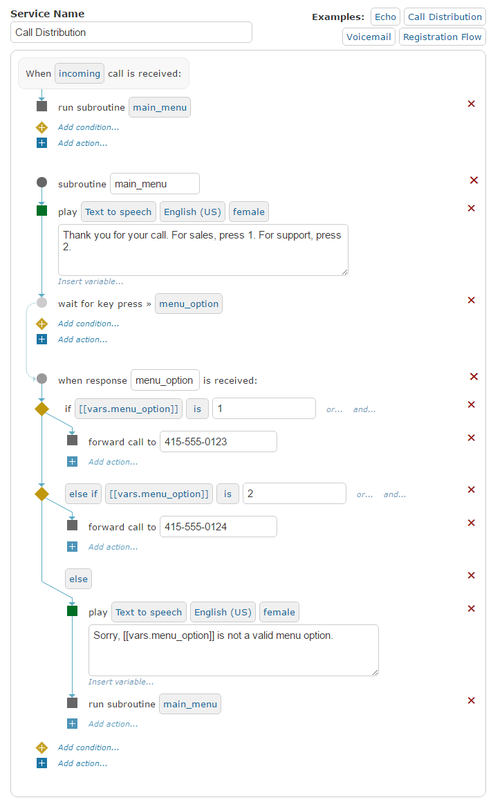 Telerivet makes it easier than ever to build your own interactive voice response (IVR) menus and call flows, run voice polling campaigns, send automated voice broadcasts, and send voice calls using a virtual caller ID. You can do it all from your browser, with no programming required. In minutes, you can get a local virtual number in over 60 countries, and send and receive calls worldwide. Businesses and non-profits can use Telerivet Voice for a wide variety of use cases, including customer support, data collection, market research, alerting, phone-banking, audience engagement, and more. Telerivet Voice is integrated seamlessly into the same Telerivet web dashboard that users all over the world have relied on over the past 5 years. To try it out, log in to your Telerivet dashboard (if you don’t have one yet, create a free account). 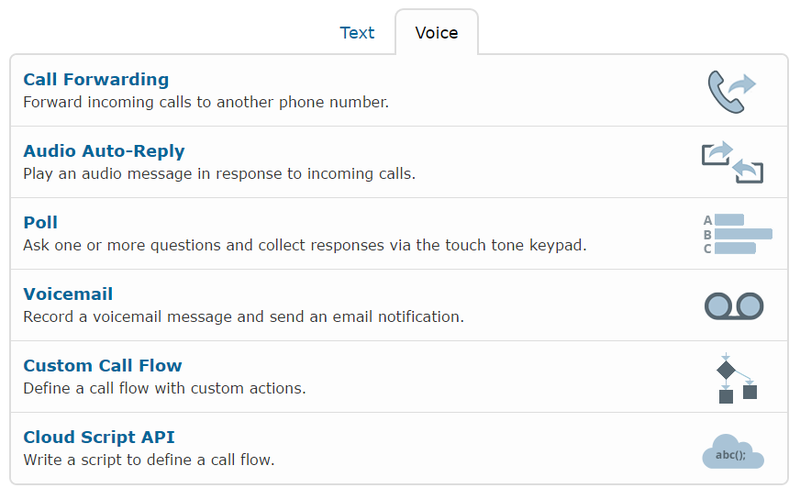 To see the different types of actions that you can use to create a call flow, click “Add action”. Call flows can play text-to-speech or recorded audio, prompt for a key press or multiple digits, forward the call, record audio from the caller, and much more. 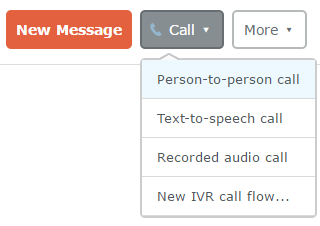 To make outbound voice calls, go to the Messages or Contacts page and click the “Call” dropdown. You can test Telerivet Voice in your browser even if you don’t have a voice-enabled virtual number, but in order to send and receive actual voice calls you’ll need to set up a virtual number on the Phones page. To learn more about how you can use Telerivet voice, visit https://telerivet.com/voice. For more details on how to use all the new features, visit the User Guide. We are excited to hear your feedback, and discuss how Telerivet Voice might help your organization. Get in touch by emailing us at support@telerivet.com . 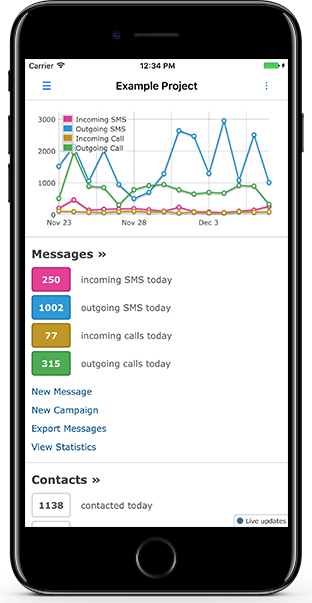 Telerivet has always made it easy for organizations to send SMS messages to groups of contacts. Some businesses use Telerivet to send notifications to groups of employees, other organizations use Telerivet for sending SMS polls, and others send SMS to notify their customers of special deals. We’ve designed Telerivet to be scalable, so that you can use Telerivet whether you need to send a message to ten contacts, a thousand contacts, or even a million contacts at once. On the Messages page, the Broadcasts tab now shows the number of messages with each status (e.g. Queued, Sent, Failed, Delivered). Click any broadcast to view additional statistics, which update in real time while the broadcast is being sent. Occasionally you might want to cancel a broadcast that’s already being sent, for example if you notice a mistake, or if you realize that a broadcast is larger or more expensive than you expected. To cancel a broadcast in progress, click “Cancel” when viewing the broadcast. The Replies tab will show the next incoming message received from one of the contacts in the broadcast (within 7 days, until you send another message to that contact). If you send multiple broadcasts, Telerivet makes it easy to quickly download their details to CSV. For example, you could use use Excel to analyze trends with your SMS deliverability, response rates, or spending. From the Messages page, click the Broadcasts tab, then click More > Export broadcasts. In addition, the REST API now lets your systems fetch broadcast statistics directly. For example, if you want your own system to show the progress of a Telerivet broadcast, you can periodically call the REST API every few seconds and get the current number of messages in each status (e.g. queued, sent, delivered) until there are no more queued messages. If you already have a Telerivet account, try out the new features from the Broadcasts tab on the Messages page. We hope you’ll find these new features useful! (If you don’t have an account already, set up a free Telerivet account first.) If you have feedback or ideas for features that would be useful to your organization, feel free to get in touch at support@telerivet.com! To learn more about how leading businesses and NGOs are already using Telerivet SMS broadcasts to reach their goals, check out the case studies for ZALORA, Asia’s leading fashion e-commerce site, and Farm Radio International, an international NGO fighting food insecurity in Africa. If you have an existing database of phone numbers, and you want to send SMS messages to them, it's easy to import the contact information into Telerivet. But how can you know if the phone numbers you've collected are actually valid, or whether they're mobile numbers capable of receiving SMS? Telerivet now makes it easy to look up information about your phone numbers via our partnership with Nexmo. On the Contacts page, Telerivet now provides a web interface to Nexmo's Number Insight API, which makes it easy to look up information about your contacts' phone numbers, including the type of phone number (mobile, landline, or VOIP), validity, mobile network, and country. You can use Number Insight to detect invalid numbers, landlines, or VOIP phone lines in your contact list, so you can clean your contact list before sending SMS broadcasts. To configure Number Insight in your Telerivet account, go to your Contacts page and click Actions > Number Insight setup, or follow this link. On your Contacts page, select any contacts to look up, then click Actions > Number Insight. Nexmo's Number Insight API will fill in information about the selected contacts. The process may take some time, depending on the number of contacts selected. 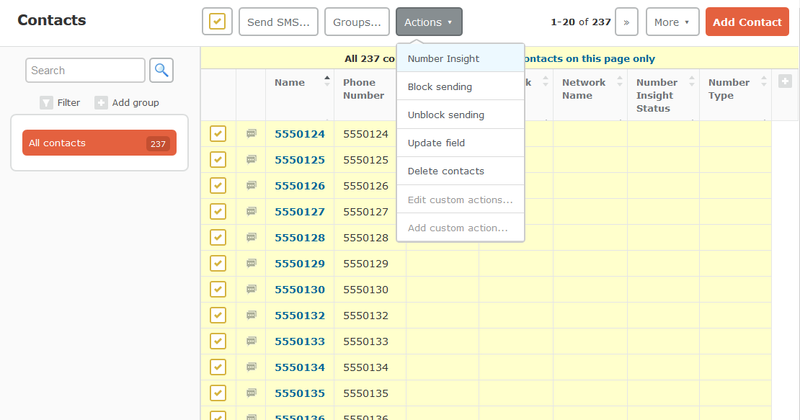 You can use Number Insight to help you remove invalid or unwanted phone numbers from your contact list before sending an SMS broadcast. 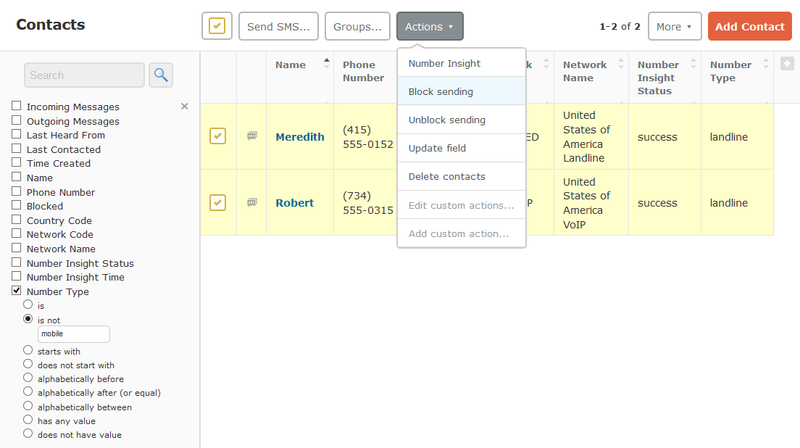 After creating a filter for the contacts you don't want, select all contacts in the filter, then either block the contacts via Actions > Block sending, remove them from a group via Groups… dialog, or permanently delete them via Actions > Delete contacts. Try Number Insight and email us at support@telerivet.com if you have any questions or feedback!